From Siu-Tung Ching (THE KILLER, HERO) and Tsui Hark (A BETTER TOMORROW, ONCE UPON A TIME IN CHINA), starring Tony Leung Ka-Fai, Jacky Cheung, Corey Yuen and Dean Shek in his final role) comes the groundbreaking live-action retelling of 1958’s UNCLE CHOY, one of China’s most famous manhua (comic books) of all time. The sound quality is good for DVD a With a 5.1 sound track but at times the bassy dialogue sounds a little distorted. The picture quality is pretty good for DVD. Good sharpness on close-ups and distant shots still maintain good detail. Colors pop but as with all DVD’s the color still has a faded look. The raid brings comic book style layovers with action that hits on different levels. We have wire work, hand to hand, sword fights and gun fights. The story is OK but at time feels rushed or jumbled and that could be from editing. Yes we have action but the movie pushes past the opening and brings in the comedy element which runs through out. Of course we see more serious tones when we get to the important story lines and action. But let’s not forget this film is based in a 30’s comic book and we see those elements mixed with comedy and action. The Story is Decent from this 1991 Action Adventure film and felt it could use some work mixing some of the comedy portions in with the serious portions but hey, it maybe because I’m an American and don’t get the style that much. But I have a feeling it came down to the editing. The action was good with mix of everything. Shoot outs are good with blood splattering, hand to hand and other weapon fights scenes were small so the movie is mostly gun action but we also get some small amounts of gore too. But when the swords do fly it’s pretty fun also involves a kid with a sling shot as well. The comedy was OK but at time can be over the top and that’s just a small portion that doesn’t get in the way much. I did find my self laughing a few times. Overall the film was a decent watch with a decent story with at times good action. One thing I wished they did was take the comic book overlay and apply it more and or take it out at the beginning. Could have been to separate story line’s and scenes. 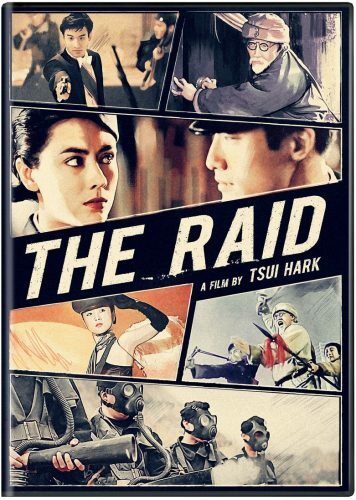 With the that said I give The Raid a 3 out of 5 as it was a decent watch and if you like 90’s Asian action involving shootouts then check it out as this film I think is the first time it’s released on DVD. It’s not bad.